To chat with a single user, just click Contacts in the left pane of the Skype window, and click the available (online) contact in the list. On the messaging screen, type a message in the field at the bottom of the screen and press Enter. The message appears as the first message in the conversation. Read your friend’s response when it appears, and type additional comments to carry on your conversation. To return to the main Skype screen, click the Back (left arrow) button on the contact’s photo. 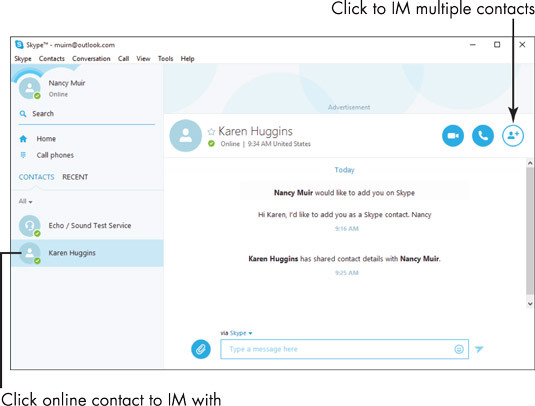 To start an IM with multiple contacts, click the Add People button on the main Skype screen or press Ctrl+N. In the list that opens, click each contact to IM with, and then click the Add button. Then type a message in the field at the bottom and press Enter. After all the group members finish chatting, click Home in the left pane to return to the main Skype screen. Skype is also available as a mobile app. Install it on a smartphone or tablet to use those devices for IM. Some online services call messaging direct messaging (DM) or private messaging (PM).